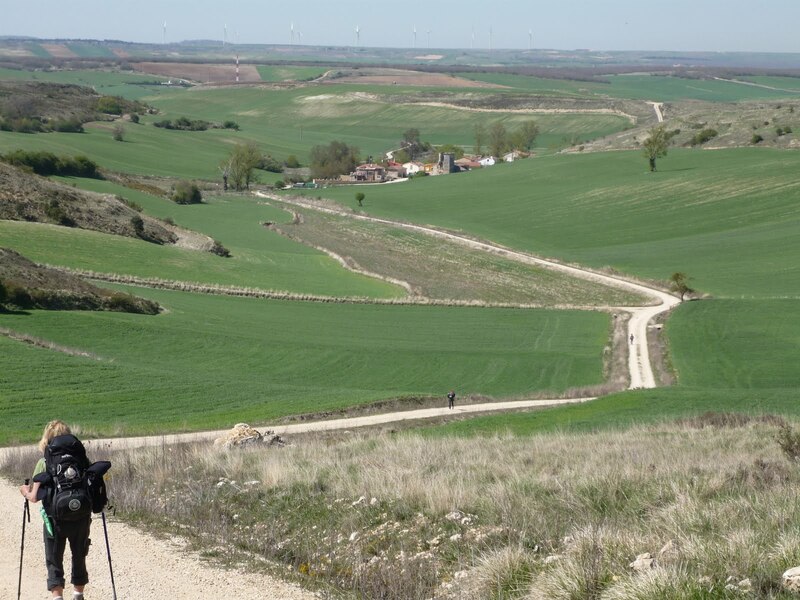 Hyping the Camino: Hola-la-la Day 12 Villafranca to Burgos! This was one of those days where ´man plans and God laughs´. We did not set out to go to Burgos in one day. The morning pilgrims were stirring by 5am and we set out wonderfully early into a perfect morning. The first two hours were a solitary walk up a steep mountain path bordered by heather. The road levelled out to a stony path cutting through a pine forest. By 9:15am we were at St. Juan de Ortega, 12.2km in 2 1/2 hours. After St. Juan we went through Ages where some stopped for cafe con leche and to strip off layers of clothes. The path branched off after Atapuerca and we went up another steep climb over very rugged, rocky terrain then it was blessedly but steeply down into Cardeñuela, our planned stop for the day. By Cardeñuela we had walked 25kms and it was already one o´clock. Unfortunately, the alberque at Cardeñuela had closed the year before and we were left with no choice but to carry on to Burgos. A couple of kilometres took us into Orbaneja where we stocked up on some calories, tortillas patatas, bocadillos, cervaza and helado (ice cream) . We left Orbaneja at 1:15pm and it was a long slow walk to Burgos. Feet were tired and burning. Some had to stop and add mefix over hot spots, others stopped to change socks and I had to take off my sock liners to make room for my swelling feet. I´m still amazed that Dayton and John can still go at the same pace. I was a trail snail. A kind senor in Castañares steered us off the traditional camino path onto a route that went along the rio into Burgos. It was not a short cut. Coming into Burgos was a bit confusing but eventually we found the alberque, a big very modern facility right, which seemed to be furnished by IKEA, near the catedra. I was surprised to be charged only 3 Euros. We´ve got a big spacious room on the third floor with showers and washrooms right by our corner and lockers beside our beds. We´re taking advantage of the washing machine and dryers then hopefully we can find a place nearby to eat. I´m also amazed that we have met up with other walkers who started from Villafranca after we did and they arrived earlier and here they are in the alberque looking fresh and full of energy. The good part of this is that we can relax a little in the morning. We can leave our backpacks at the alberque while we tour the city but we can´t collect them until noon. 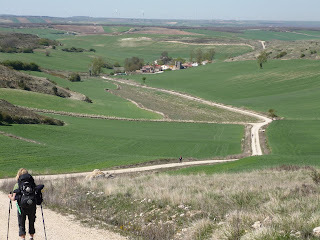 Then I think I´ll vote for a short walk in the afternoon to Rabe de las Calzados only 12kms out of Burgos. Feet are aching, legs are tired and brain is not very creative but the laundry is done, the alberque is comfortable and clean and tomorrow promises to be a new and easier day.